Do you wish to explore the meditative, transformational & healing aspects of sound more deeply? Or find a unique way to connect with a loved one? I offer treatments for individuals, couples or families here in Cornwall. A space dedicated just to you & the sound! Treatments on individual basis (or with a partner, friend or family) allow you to experience a more focused sound meditation/ journey where (unlike the group sessions) we are working only with YOUR intention, be that physical healing or spiritual growth. Some of the many therapeutic benefits of sound include: mental clarity, emotional balance, pain relief and coping with stress. I have worked with people in various states of health, all ages and from all walks of life. I love that more and more people are opening to sound as the thread that connects us all, and can reconnect each of us to Self or Spirit. Each session is unique and intuitive, beginning with a confidential consultation which helps us both understood where you are at right now, on every level. Once you know if this path is for you, I recommend a course of treatments to create lasting change. During a sound massage treatment I invite you to set an intention, relax, breathe and simply follow the sound. A selection of Himalayan ‘singing’ bowls is placed gently on and around the body, cocooning you in healing sound inside and out. I also use my voice (toning and mantra), rain sticks, chimes & gentle drumming. 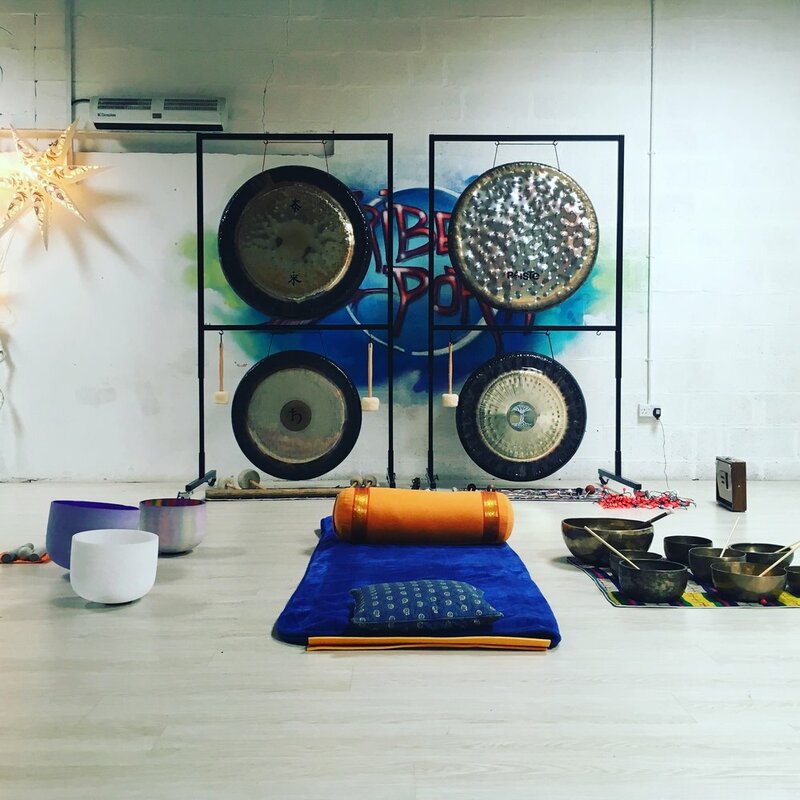 The gong is an instrument of transformation & peace which has a unique ability to ‘bypass’ the mind and allow healing to take place. During the session several high quality planetary and symphonic gongs are moved around the space and the body, bringing you into contact with the power and subtleties of their universal sound. Other instruments guide your journey such as conch shell, crystal bowls, shakers, my voice & shruti box. Regular appointments available in my mini sound temple near St Just and at Helston Holistic Therapies (singing bowls only). Home visits can be arranged on request. Please contact me if you'd like to have an initial chat about whether this is for you, and for availability & investment.